collectSPACE - news - "Toy Fair sparse on space in shuttle wake"
February 23, 2005 -- As NASA makes progress towards returning the Space Shuttle to flight, companies exhibiting at the 2005 American International Toy Fair in New York said this past weekend they were waiting for the May 15 launch to deliver the increased interest by the public that would inspire their producing new space exploration toys. After the loss of Space Shuttle Columbia two years ago, some toy companies decided to pull their orbiter models and playsets from the market out of respect to the fallen crew, while others re-tooled their lines that were to debut at the 2003 Toy Fair. The effects of such decisions were seen at this year's Fair, where toys mimicking real space missions were fewer in number. 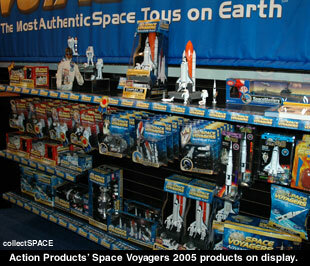 Space toy staples Action Products International (Space Voyagers), Dragon Models and Daron Worldwide Trading showed buyers and the media limited new space products to be introduced in 2005. Companies with space-related toys at last year's show, including rocket provider Estes/ Cox, were absent from the Fair, while others like Code 3 Collectibles, were exhibiting but did not show their space history-themed lines. "Space [as a toy subject] is a lot like a license," said Greg Zesinger, Marketing Director for Action Products, "when its in the news, interest and sales are higher." "[The loss of Columbia] did not effect the development of our products as much as NASA's return to flight will bring space to the top of people's mind and they will gravitate to like products," said Zesinger, whose Space Voyagers' playsets and astronaut action figures are marketed as the "most authentic space toys on Earth." In time for the May mission, Action Products is releasing a deluxe version of its Complex 39 Space Shuttle playset with an upgraded orbiter and new diecast vehicle. Also on the schedule for 2005 are a new Lunar Rover set and an inflatable Saturn V rocket. Nearby Aeromax Toys, which in 2004 introduced their Jr. Space Explorer orange spacesuit children's costume and inflatable Space Shuttle were modeling their adult version launch and reentry (ACES) suit and an interactive helmet with power visor and intercom feature for kids. 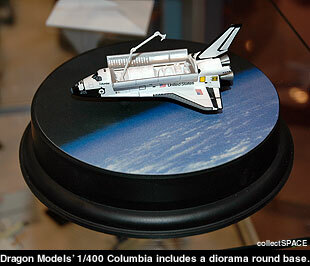 Dragon Models continued their 1/400 Space Shuttle line throughout the two years since the accident, though they were showing their first Columbia diorama after its loss. Collectors may recognize the model, as it was previously announced as a replica of Challenger. Odyssey Toys, maker of the wooden Apollo Scapes sets for young kids, did not have any new space toys to show though they indicated that a vehicle similar to their rescue and construction trucks, such as a lunar or martian rover, was under consideration. 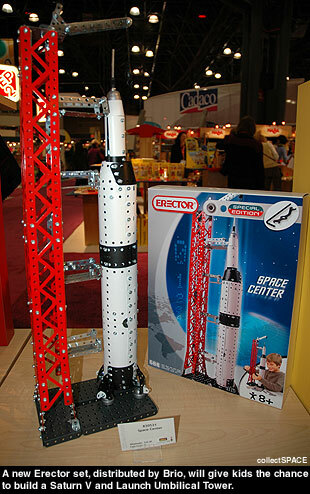 A special edition Erector building set, to be released in June by Brio in the United States, will construct a replica Saturn V rocket and Launch Umbilical Tower (LUT). The metal model is one of several new Erector kits scheduled for 2005, though the only to have a space-theme. For those who prefer plastic models, Revell Monogram is adding a Space Shuttle kit to their growing line of models and "historical book" sets. A larger, 1:72 scale orbiter is also listed in their 2005 catalog. MoonBalloons, the only company to debut with a space focused product this year, showcased their lighted crater- covered helium balloons, each named and colored for a different planet or astronomical body. 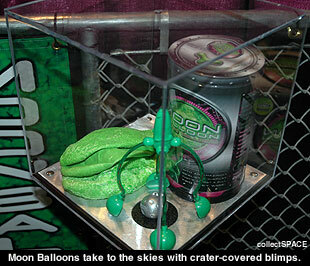 Designed for use at night, the balloons are packed within launch kits.